The Stovall Belly Dancer Shaker provides a unique, gentle and efficient mixing and washing action by undulating in both vertical and horizontal motions for gel and blotting techniques. This lab mixer creates a rapid solvent exchange at adjustable speeds between 0-120 RPM, and has an adjustable collar that shifts the angle from flat up to 12°, simply rotate the collar to the lowest point for the deepest angle. The 3/8” cast acrylic platform of this orbital shaker will hold up to 20lbs on the 12 x 12” square and is open sided to accommodate large containers. 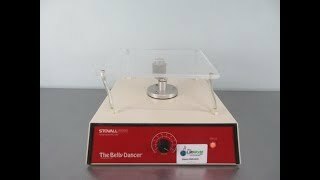 The Stovall Belly Dancer Shaker can be used in environments such as incubators or cold rooms with ambient temperature tolerances of between 0-40°C and up to 95% non-condensing humidity and is a great choice for applications in cell growth, immunoprecipitations, filter washing, blotting and protein gel staining and de-staining as well as general mixing. This Stovall Belly Dancer Shaker has been fully inspected and is operating without issue. All of our lab equipment comes backed with our standard warranty. Should you have any questions, please don't hesitate to contact us.